Trailer - Count With Me! A graphic designer by trade, Felix is a story teller and loves to delight his children with ridiculous and fantastical stories about all sorts of... stuff! "My children love my stories so they must be OK right?". Count With Me! 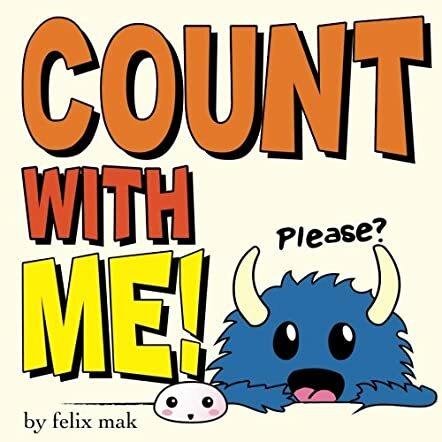 by Felix Mak is a stunning, interactive children's book that encourages young children to count. The book follows a young monster. The monster would like to know how many fingers he has, and would like to know how many fingers you have. The monster would also like you to count his horns, and is wondering how many horns you have, and is very surprised that you don't have any. The little monster is curious as to how many toes he has, and would also like to know how many toes you have. He'd like to know how many tails he has, and is shocked that you don't have a tail. What else will you count? I really enjoyed reading Count With Me! by Felix Mak. The book is very, very creative and well written. I liked that the book is interactive, because it will make the young reader want to count. The book teaches comparisons between numbers, because it always compares the amount you have to the amount the monster has. I liked that the book has a few pages that the child reader can colour in. The monster is very friendly and has a few funny lines. The pictures are very well drawn and bold. The pictures of the little monster are also very cute. The story is well thought out and well developed. This book teaches many things, and all preschool classes should have a copy. I would definitely recommend this book to all young readers. Gorgeous book! My neice was lucky enough to be given a copy and she loves it!! It's just so much fun, makes learning into a game.